Some say the world will end in fire, some say in ice. 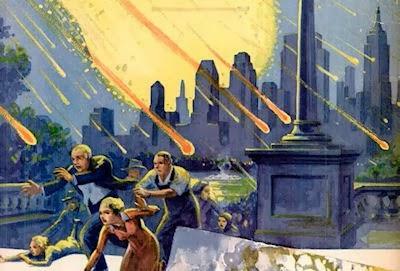 The scientists of 1939 would like to add 'moon explosion' and 'giant meteor' to that list - and they created some terrifying paintings to show you just what humanity's demise will look like. Popular Science published those apocalyptic illustrations, along with a very upsetting three-page article, in its September 1939 issue.